Fixed Power and Memory fan increased fanspeeds when starting Precision XOC or switching skins. Fixed GPU fan not allowing software fan curve when starting Precision XOC or switching skins. Improvements to EVGA Z10 keyboard compatibility. Various bug fixes and GUI improvements. I'll try to test it soon! Keep it up. Please note that I uninstall the previous version completely and do a clean install. LEDSync is not uninstalled automatically with Precision XOC, so this will be overwritten. Even though many will overwrite their old installation, when issues occur they are often advised a clean installation. This is why I test using a clean installation of Precision to make sure the bugs do not come from old configuration files. [6.2.6.1 BETA][LEDSync 1.0.9] LEDSync will crash abnormally using 'End task' in taskmanager. I must say that LEDSync doesn't actually crash initially, but ending the task afterwards makes it get stuck. It may however still be unwanted that windows says LEDSync became unresponsive, Precision XOC ends its task normally. [6.2.7] Start minimized is affecting whether Precision XOC starts with Windows instead of 'Start with OS'. It looks like the settings 'Start minimized' and 'Start with OS' have their functionality switched. [6.2.6.1 BETA] Splash screen does not disable using the setting 'Start minimized'. [6.2.6.1 BETA] Start minimized is not functioning. [6.2.7][iCX] Power and Memory automatic fan control is not enabled/working after a fresh installation and saving a fan curve without closing Precision XOC once. This is very likely an important issue that needs to be addressed quickly. Working properly on 1080Ti FTW3. Note: There is some delay before Power/Memory fans kick in, but this will happen faster if fan speed update period is changed to a faster rate. [6.2.6.1 BETA][iCX] Power and Memory fans control are inverted. [6.2.6.1 BETA] Precision XOC update pop-up for new version only works after opening settings once. Note: Found when 6.2.7 released, likely same behaviour in 6.2.7. Note: It looks like the settings 'Start minimized' and 'Start with OS' have their functionality switched. Note: In my case the fan curve itself is saved. Precision XOC is freshly installed with no old configuration files. Automatic fan control is enabled with a fan curve saved. GPU / Power / Memory automatic fan control buttons are enabled. User reboots the system without closing Precision XOC a first time after a fresh installation. User starts Precision XOC after reboot, Power & Memory automatic fan control buttons are not enabled and fan curve will not work automatically. [6.2.5.2 BETA][iCX] Power and/or Memory fan ramp up to 50% or 100% fan speed when starting Precision XOC or switching from skin. [6.2.5.2 BETA] GPU fan does not follow software fan curve when starting Precision XOC or switching skin. [6.2.5.2 BETA] Clicking on "Curve" button shows 'Enable Automatic Fan Control' as enabled even if it's disabled. [6.1.8][OSD] PNG screenshot capture with Precision XOC shows image corruptions. [6.1.2][Appearance LED] Breathing mode for backplate LED 1080Ti FTW3. Not fixed in releasenote of 6.2.5.2 BETA. [6.2.4][OSD Settings][Skin] Not able to set individual system tray colours for each sensor in default skin. Workaround: Set tray colour settings in Kingpin skin OSD settings. [6.2.4][OSD Settings][Skin] Not able to set minimum/maximum values for each sensor in default skin. This makes "Play alarm sound when value is out of range" useless. Workaround: Set minimum/maximum values in Kingpin skin OSD settings. [6.2.4][OSD Settings][Skin] Not able to set alarms individually for each sensor in default skin. This may be useful to ignore some buggy reportings such as framerate. Workaround: Set alarms individually in Kingpin skin OSD settings. [6.2.4][Hardware monitor] Buttons GPU1, System and others are not displayed when Precision XOC is minimized OR clicking inside Hardware monitor window while Precision XOC is open. Root cause has been found: Enabling 'Start with OS' affects this functionality. [6.2.4][OSD] Games crash when Precision XOC is exited when OSD is (or has been) enabled in a game. NOTE: Issue may have existed for much longer. [6.2.5.2 BETA][LEDSync 1.0.9] Disabling backplate entry in LEDSync of the same videocard does not revert back to original Appearance LED setting. [6.2.6][Sensor] Sensors stop displaying after pressing L-ALT button. [6.2.6.1 BETA][iCX][Thermal LED] Inconsistency between Precision XOC LED temperature display and hardware Thermal LED display. [6.2.6][iCX][Thermal LED] Thermal LEDs on hardware do not update according to software settings until settings is opened once. [6.2.6][iCX][Thermal LED] Thermal LEDs on hardware do not update after closing Precision XOC. [6.2.4][iCX] EVGA 1080Ti FTW3 Power/Memory sensors not tracked by default in hardware monitor. Disabling the < > arrows at GPU/Precision Logo location. [6.2.4] Show FCAT overlay not functioning in every game. Update: added the following issue: [6.2.7] Start minimized is affecting whether Precision XOC starts with Windows instead of 'Start with OS'. Update 2: added the following issue: [6.2.7][iCX] Power and Memory automatic fan control is not enabled/working after a fresh installation and saving a fan curve without closing Precision XOC once. I have downloaded this new version and when I try to save the "enable autromatic fan control"
I use aggressive setting, it does not save when I restart my rig. Dose not save also on restart??? After enabling your fan curve or making any other Settings/Profile changes, manually close Precision..Otherwise, most settings will not remain and will be lost upon start up..It should probably be okay after you do that. Ok will try that, thanks. Ok that did the trick, thanks for your help. • When a 3D Profile is assigned in the Profile tab, running a 3D application causes Precision XOC to close upon mouseover of the Precision XOC Sytem Tray icon..The PrecisionX Server remains open..Fan speed gets stuck at the current rpm. • When a 2D Profile is assigned in the Profile tab, running a 2D application causes Precision XOC to close upon mouseover of the Precision XOC Sytem Tray icon..The PrecisionX Server remains open..Fan speed gets stuck at the current rpm. The above bugs may take a short time to reproduce. Workaround: Don't assign a 2D and/or 3D Profile..OR..Open and then click OK to close Settings after assigning a 2D and/or 3D Profile every time Precision XOC is started. • Most Settings (including fan curves), Profiles, OSD options, and HWM items still aren't being remembered/sticking unless Precision XOC is manually closed after making changes. Workaround: Best practice is to manually close Precision XOC after making any changes in Settings, Profiles, OSD options, HWM and overclocking adjustments. • These things have been ongoing here for many versions now. I know I've said it before, but it seems like this is working fine. thermal leds settings aren't working as they should (at least on my FTW3 Hybrid), "P" and "M" are okay, but "G" uses a +10°C offset from what you've set if pxoc is closed. the "G" will turn blue at 49°C, and green at 59°C, I wasn't able to hit 70°C with the hybrid though. Thanks Bob that what I have trying saying about early version 6.2.4 that both 2D and 3D cause windows because it hard to explain ! I did take off not to Assigned both 2D and 3D mm it running beautiful!! That version is better and did load fan start up and it working when I try add on *******.exe in to PrecisionSever for ODS game which some game not support OSD on DirectX 12! I think everything look good with 6.2.7. Can't see any fault or error yet but will keep looking and test!! Hope it same go with ICX!!!!!! Thermal leds on my 1080ti FTW, yeah they still don't work unless I go to settings after start up. I rely on those indicators since my case has a window and some games don't show the OSD overlay. Anyone confirm if manual overclocking has been fixed using the voltage/frequency curve?. It's been broken since 6.1.4 as reported by others for sometime now. Installed and set for Aggressive Fan Curve. Set a profile for 117% power target and 90c temp target. Upon launching, at first the GPU fan shows about 50% on slider, Power and Mem at 0. RPM for GPU fan shows zero. In a few moments the fans kick in appropriately, and all show around 50% and gpu fan showing app 1300 rpm. This behavior of the GPU fan slider occurred in the previous beta as well. I believe it is just a graphical bug in how it shows the slider. I notice now the aggressive fan kicks in sooner than in previous versions, which is nice. Not as much lag after starting PXOC until the fans kick in. 6.2.6 seem to fix my issues with 100% fan speed on start-up, downloaded 6.2.7 and the first few times had no issues with the fan speed at start-up today it did it again. Going to try and reinstall 6.2.7. I did remove all folders from 6.2.6 before installing 6.2.7. I believe it's not a graphical bug, however for me it's a bit tricky to look directly at the GPU while starting Precision XOC. GPU-Z is showing the same delay on the Power/Memory fans kicking into action, atleast they work though. Update: I'd like to add that changing the fan speed update period to for example 500ms makes the Power and Memory fans kick in pretty instant together with the GPU fan. In addition, when you upgrade from 6.2.6, after the first reboot the apps don't start alone. - In HWM the "GPU" and "System" options desapear if you click anywhere into the hardware monitor window... the options are back if you click anywhere into the main PrecisionXoc window. When you try to enlarge the hardware monitor window the options are back only when you grab the border. This issue is apparently caused by the setting 'Start with OS', if this option is disabled it works properly and does not disappear. I've yet to test this with 6.2.7 however. Edit: Another funny thing, only after opening the settings window after start-up on 6.2.6.1 BETA, the update pop-up will appear for 6.2.7. Nobody else worried that the server is wasting CPU performance even when OSD is not active and nothing is monitored in HWM? It's constantly trying to access a non existent file. And it will just restart after killing it in Task Manager. This happens since 6.2.6 ("OSD control is now handled in the “HWM” section."). 6.2.3 doesn't show this behavior. I did not really keep track of the performance statistics with Precision XOC. But I can see the same occuring on 6.2.6.1 BETA in taskmanager. 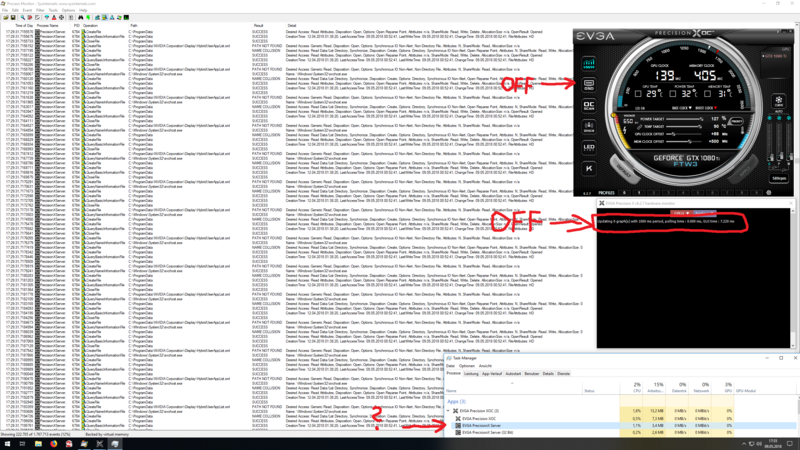 Yup the fans settings are not saving at all, I saved a profile now so when I start up my rig I go in there and check it off. Not much hassle but it would be cool to just start it up with out worrying about it you know. Any past releases of OXC that work. I have a evga 1080yi ftw3. I have a question about this utility. I heard about it on Steam and I installed it. I'm using it to try to get my temps down a little on American Truck Simulator. I haven't had any problems with the default settings - I have a GTX 1070, Win10 Pro, i7 6800K, and a Samsung 850 Evo SSD. I have high settings on the game because it helps get rid of some of the "shimmering" effects. My max temps without this utility have been around 70 C. When I installed version 6.27 and experimented with the fans, I set it at about 40% fan speed. It brought the temps down about 10 -11 C. My question is this- will this have a negative effect on my G.P.U. because of running the fans at 40%? Thanks. EVGA has been using very durable dual-ball bearing fans for many years on their videocards, those last much longer than regular sleeve bearing type fans that many other brands (used to) equip their videocards with. It'll just be a little more noisy. However the videocard can handle temperatures of 70°C completely fine so a fan speed increase is not exactly necessary. But at 70°C I can imagine the videocard dropping its boost clocks a little bit, it may give a slight decrease in performance but for most barely noticeable. A lot of videocards come with somewhat conservative silent fan profiles from factory. Most of the time people would like to buy hardware that isn't too noisy but still cools well enough. Thank you very much for the reply. I had been told by some people in the American Truck Simulator forums that they thought 70C was a little warm. I feel better about it now. Thanks again. PrecisionX closes after restarting, and when manually starting it again. Just closes every time. It wasn't happening with the last beta version for a short while, then it too started closing. This is beyond ridiculous. i7-6700k @4.4ghz/1080ti FE/16gb 2133 DDR4 ram/AsRock Extreme 4 z170 Mobo/EVGA Supernova 850 PSU/256gb SSD Main/WD 2tb Velociraptor/4k LG mon./pair B&W 601se + Affordable Accuracy Monitors/SVS PB-2000 sub/Denon AVR S710w 7.2ch receiver. Please try a complete clean installation if you didn't already. And is this occurring on Windows 10? build 1803? That bug can happen if you have a 2D and/or 3D profile assigned in the Profile tab of the General Settings, as in Post #9 above..If you have a 2D and/or 3D profile assigned, set them to "Not assigned", click OK, then close and open Precision again, and see if it matters. It's weird, those processes only show up in task manager when PXOC is minimised to the system tray for me. As soon as I open PXOC to view it or make changes, they automatically disappear out of task manager. I have to open the settings menu and click ok to apply hotkey settings already showing present for them to work. Occurs every time I restart the software.